Siúbhán sends her husband into town to buy her a new pair of shoes, but he spends all the money on drink, so she is not amused. Traditional song from Donegal. A dhíol is a cheannacht mar a dhéanadh mo dhaoine romham. Is le Siúbhan Ní Dhuibhir gur ól mise luach na mbróg. A Shiúbháin Ní Dhuibhir, an miste leat mé bheith tinn? Mo bhrón is mo mhilleadh más miste liom tú bheith i gcill. Ach cead a bheith in Iorras go dtara síol Eabha chun cinn. Susan O'Dwyer do you care if I'm ill? A Shiúbháin Ní Dhuibhir, is tú bun agus barr mo scéil. Is nach mise an trua Mhuire bheith ag scaradh amárach léi. Planta an leinbh a d’eitigh mo phosadh inné. Go dtabharfainn di tuilleadh dá gcuirfeadh sí bólacht léi. Ó chuala mise gur chuir sé le bólacht mé. Bíodh a rogha bean aige ‘s beidh mise ‘r mo chomhairle féin. Written by Thomas after a concert in Røros. Some people say about this old mining town in Southern Norway: "In Røros the winter lasts nine months and the other three months are really cold!" Though that’s not really true. 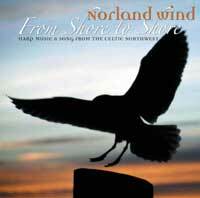 One of the best songs of all time – as topical as ever - written by the late Ewan McColl, and arranged by Kerstin, Thomas, Ian and Máire. Written by Máire, these reels provide a contrast of colour and energy, alternating between a slightly subdued A Minor and a lyrical A Major. "Branohm" is a phonetic spelling of an Irish language phrase, the meaning of which is "letters observe". Somewhat mischievous merry dance through the above-mentioned, it rolls along in the manner of a busy stream of consciousness. "The Green Fields of Gweedore". Noel and Pádraig come from Gaoth Dobhair, the parish in the Northwest corner of Ireland. In this emigration song the beauties of the home left behind are praised. Proinsias Ó Moanaoigh wrote it in the seventies. It became a hymn for Gaoth Dobhair people all over the world. Ian adds a verse of "Paddy’s Green Shamrock Shore" as both songs share the same melody. A modern Christmas tune, written by Thomas, based on the Isle of Man hymn "Tra Va Ruggit Creest" (When Christ was Born). "Listen", written by Máire in 1992: Midir and Éain, lovers in the Otherworld, dwell among the Gods, but dream of spending an Earth lifetime together. They know they will recognize each other by the sound of their voices on the wind. O mhaidin go nóin, is as sin go deireadh lae? Is casfar le chéile sinn roimh dhul faoi don ghrian. Ba mhór é mo bhrón, ’s ba mhinic mé faoi néal. Is sheasfainn sa tsneachta is tú ag gabháil fhoinn go binn. Nach amhaidh don tseachtain, mar a shíneann sí go bliain. Is casfar le cheile sinn roimh dhul faoi don ghrian. From dawn till noon, and again till day’s end? My sorrow great, my spirits often low. And I’d stand in the snow to your sweet song. From dawn till noon, and again till days end? Written by Kerstin in the tradition of the waulking songs in the Western Isles of Scotland, the words describe the ravishing beauty of a Scotsman. So favour me with your glance! Written by Ian in Scotland about a sheep dog of friends – the archetypal "little devil." He (whistle) runs rings around his master and mistress (harp and fiddle), who eventually give up trying to calm him down and just join in. The group’s version of this well-known song about the 1916 Easter Rising. This rebellion against the ruling British was defeated but led eventually to Ireland’s independence. To a city fair rode I. They flung out a flag of war. When you fell in the foggy dew. "The beautiful red-haired girl". Pádraig wrote the lyrics about this very Irish subject, Kerstin set them to music – always fantasising of a Norwegian bloke called "Tore" in the chorus. Written by Maire, this piece is a gentle lullaby for Gráinne and her lover, Diarmuid Ua Duibhne. In order to avoid an arranged marriage with the much older Fionn Mac Cumhaill, Gráinne eloped from the palace of Tara with the handsome warrior Diarmuid, and they spent the next sixteen years on the run from Fionn and his army, living as nomads in the woods and valleys of Ireland. A love song from Donegal praising the beauty of a woman called Máire Bhruinneall who leaves the author broken-hearted. ’S tú d’fhág mise i ndealraimh ’bháis. ’Gus gach a bhfuil beo domh bhris tú mo chroi. S d’fhág tú mise i ndealraimh ’bháis. Written by Thomas on Tory Island in the Northwest of Ireland. Tór Mór is the eastern tip of that island which is a jewel of Gaelic culture in music, song, and poetry. A match making song dealing with the same subject as the following song Pós an Píobaire. Míle grá le m’anam í / sí Peigín Leitir Mhóir! ’S é ’n scéala ’chuir sí aniar chugam / go ndéanfadh leathbhád seoil. Le solas gealaí gile / nó go bhfeicidís an tseoid. Comhair do chuid bullán / agus féach a’ bhfuil siad ann. "Marry the piper" – a match making song. A young woman is supposed to marry an old farmer (who plays the pipes) but she refuses the match the parents have made, probably because he is incapable of playing the intricate rhythm as in the music written by Kerstin.